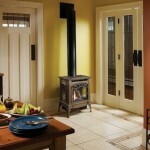 The Greenfield tm cast iron gas stove is a true revolution in stove design. Combining clean lines, graceful proportions and traditional cast appeal, this wide-view stove can be considered a freestanding fireplace! The number one feature on the Greenfield is the incredibly large 749 square inches of ceramic glass. The open, three-side glass design allows you to view the incredibly realistic log set and dancing-flames from any angle in the room. 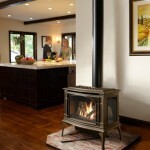 Another great feature on the Greenfield gas stove is the downward pointing accent light. This beautifully highlights the logs from the top, giving the fire a radiance never before offered in a freestanding stove. The Greenfield is designed to be a powerhouse of a heater; with an input of 40,000BTUs it can heat up to 2,000 square feet. Think of the Berkshire as a functional work of art. Its classic balance and symmetry resembles a piece of fine furniture. 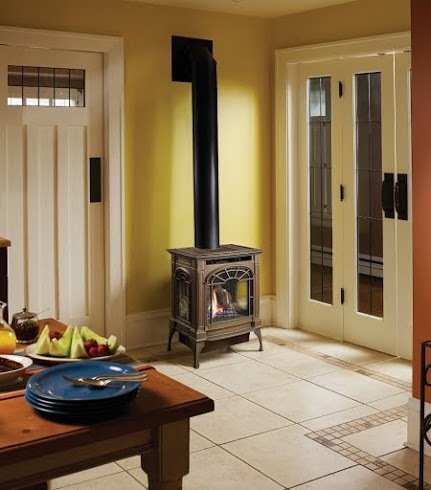 This solidly built stove features decorative cast iron on the outside with a heavy-gauge unibody steel firebox for added durability on the inside. Design details include a large glass area (18″ wide by 12″ high), and raised Linenfold side panels with delicate cast iron moldings that are typical of early American architectural style. 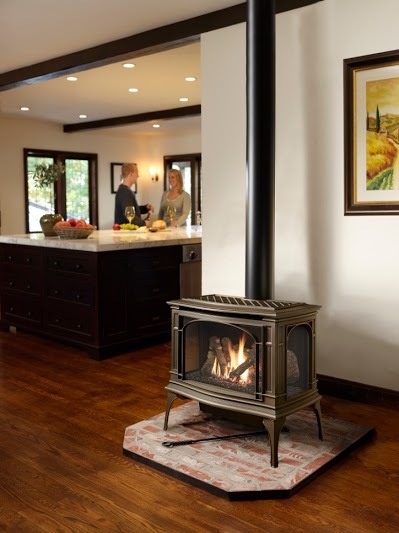 Beauty, heat and a therapeutic benefit – it’s no wonder the Berkshire is the best selling cast iron gas stove in America. 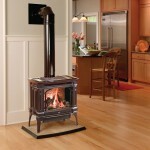 The Northfield tm small cast iron gas stove has a classical Early American design and three-side fireview. Despite it’s size, the Northfield boasts an incredibly large 416 square inches of ceramic glass – which highlights the realistic wood-like fire from any angle in the room. The Northfield produces up to 22,000 BTUs and can be top or rear vented.